Chess is a game of war between two armies, one of sixteen white or brown pieces and one of sixteen black pieces, at the start arranged in two rows at opposite ends of the chessboard standing face to face. One chess piece can occupy only one space. In the front row of each side are the eight Pawns, followed in the back row by two Rooks at the ends; next to them the two Knights; then come the Bishops; and at the center the King and Queen, with the Queen on her own color. The chessboard consists of 64 squares, alternating in black and white, with a white square, by international standard, on the far right of the first row for both sides. The player who controls the white or brown pieces moves first. This time we show you the brown chess set amount 16 pieces. Made from best quality of Teak wood and polish well in glossy brown. Those pieces are stand on wooden board that made from Teak wood also. 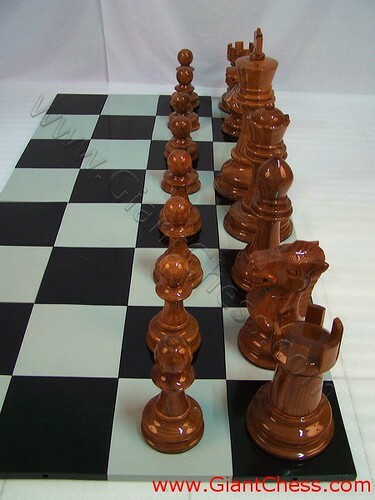 Perfect for your chess collection because this set can used for outdoor game and very durable.